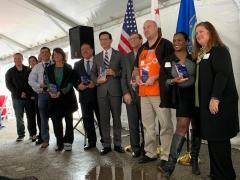 A ceremonial groundbreaking ceremony was held Monday, January 7, 2019 to celebrate what will become the largest veterans housing community in Orange County. The Santa Ana Veterans Village, located in west Santa Ana on First Street near Harbor Boulevard, will provide 75 permanent supportive housing units for homeless veterans and their families. The completed village will include a Spanish-style, u-shaped three story building containing furnished one- and two-bedroom apartments, a 4,500-square foot community center and 10,000 square feet of active open space including barbecues, a community garden, dog run, and basketball half court. With funding provided by the City of Santa Ana and County of Orange, Santa Ana Veterans Village is a project of Jamboree Housing. Jamboree’s design concept for this innovative development is “to be a sanctuary of stability and a hub of hope” for some of Orange County’s most vulnerable veterans. A comprehensive veteran services center will provide onsite mental health counseling, wellness services, employment services and legal assistance to help tenants rebuild their lives after struggling with homelessness. A 2017 survey of Orange County’s homeless population found that 12% of the homeless were veterans. Since the release of the survey, the County of Orange adopted a plan to fund construction of 2,700 supportive housing units over the next three to five years. Jamboree’s Santa Ana Veteran’s Village is the first project of this countywide plan.